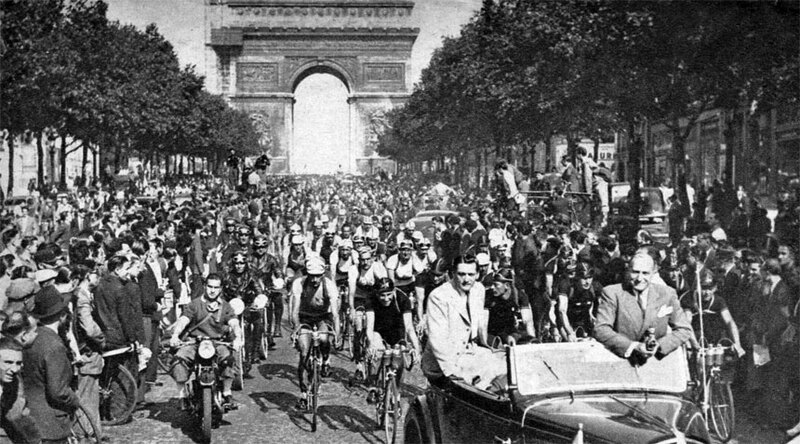 The 1947 Tour de France was the 34th Tour de France, taking place from June 25 to July 20, 1947. The total race distance was over 4,640 km split into 21 stages. The winning average speed recorded as 31.412 km/h. It was the first Tour since 1939, having been cancelled during World War II, although some Tour de France-like races had been held during the war years. It was also the first organised by L’Equipe, a change made necessary by the closure of L’Auto in 1944. The race field was made up of 10 national teams: Belgium, Italy, France, Netherlands / French foreigners, Switzerland / Luxembourg, France West, Ile de France, France North-East, France South-East and France South-West. The rider breakdown was 58 French, 13 Italian, 11 Belgian, 6 Dutch, 6 Swiss, 4 Luxembourg, 1 Polish and 1 Algerian cyclist. Of the 100 riders that started only 53 finished the race. Because the previous races had been cancelled, there was no real favourite for the final victory. When René Vietto, the runner-up of 1939, captured the yellow jersey after his victory on the second stage, many thought he could remain first until the last day. Vietto, a climber, was less optimistic and lost his first place to Italian Pierre Brambilla after the time trial in stage 19. With only two stages to go, many now believed that Brambilla would win the race. On the very last stage, there was an unexpected attack, and little-known French cyclist Jean Robic captured the lead. Robic had won the Tour de France without ever wearing the yellow jersey during the race, the first time that happened.